Experience this Historic Gem of the Past at Union Gables Victorian Mansion Inn, on over one acre with perennial gardens, fountains and sitting areas in the heart of Saratoga Springs. Built in 1901, a beautiful version of the Queen Anne style by Newton Bresee, the mansion is a true testament to the elegant days of Saratoga’s past. Seasonal heated Romanesque-style pool open from May through October. Each room is equipped with a gas fireplace, mini refrigerator, plush robes, luxurious linens and amenities. Most rooms have king beds, 43 inch flat screen televisions, High-Definition On-Demand cable TV, some rooms available with kitchens, living rooms, Jacuzzi tub, private patios, and seven pet friendly rooms. 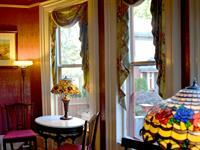 Complimentary wireless internet on the grounds and in rooms. Breakfast is served every morning and is cooked fresh to order by our Chef. Guests at Union Gables Inn enjoy complimentary bicycles to explore the Saratoga Springs area. Union Gables is located in the Historic district, two blocks to Congress Park and Downtown Saratoga Springs, and one and a half blocks to the Saratoga Racecourse. Suites available for longer stays in our luxury residence at our sister property, The Alexander House Suites, as guests enjoy all the amenities of the Inn within a grand living space. Just over one mile off Exit 14 on the Northway (I-87), and two blocks before Congress Park on Union Avenue (9P). Take a right onto Clark St, and park in the Inn Parking lot behind the building.